The mid-size Toyota Camry four-door sedan has become known for reliability, a comfortable ride, a roomy interior, and decent gas mileage. The available Camry Hybrid model holds all of those attributes while boosting fuel economy. With characteristics like that, the Camry has become a legend with U.S. car buyers. With the Camry, Toyota has inspired lots of automakers to build better sedans in the segment. 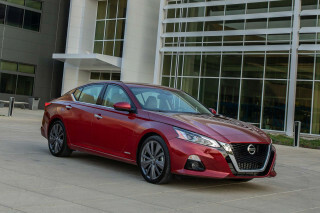 The set of rivals for the Camry is vast, and includes excellent cars such as the Honda Accord, Ford Fusion, Subaru Legacy, and Nissan Altima, as well as the Hyundai Sonata, Kia Optima, Mazda 6, and Chevy Malibu. There's not a bad choice in that group. The Toyota Camry was new with a revised engine lineup and a shapely body last year and it carries over mostly unchanged into 2019 aside form the introduction of Apple CarPlay. It's sold in SE, LE, XSE, or XLE trims, with the Hybrid version now offered in LE, SE, and XSE versions. The eighth-generation Toyota Camry was unveiled in 2017 went on sale as a 2018 model. The new Camry's look is its boldest yet, with its previous slab-sided mid-sized appliance vehicles fading from view. The 2018 Toyota Camry is lower and wider than the model it replaces, and riders sit an inch or more lower front and rear. The lines are crisp, not overly stylized (as in some other recent Toyotas) and overall we think the car looks stylish without being strange. Perhaps the front end is a mite exaggerated, but the shape of the slightly longer and wider Camry is a big win. For 2018, Toyota has split its Camry into two more distinct flavors: LE and XLE models are a little more conservative, while SE and XSE variants feature sportier accoutrements, reaching their zenith with the XSE's optional bold black roof and unique two-tone rear roof pillar design. 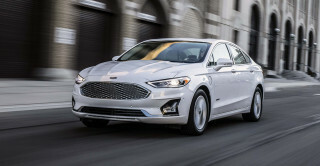 The SE and XSE also have their own suspension and steering settings in an effort to appeal to consumers looking for a sports sedan, but this is no Mazda or BMW. The entire range handles more crisply and confidently, a direct result of Toyota CEO Akio Toyoda's engineering prowess and enthusiasm for racing, but while the Camry is now enjoyable to drive—as opposed to tapioca on the road—it won't be mistaken for any kind of rival to the more dynamic Accord or the Mazda 6 sport sedan. Under the hood, the Camry sticks with a classic choice: the high-volume inline-4 or pricier and more powerful V-6 engines. Other competitors have moved to a lineup of solely turbo-4s to meet fuel economy standards, but not Toyota. Both engines are paired to an 8-speed automatic. No manual transmission is available, but that's hardly a surprise. The new Camry benefits from Toyota's switch to a uniform, global architecture underneath, including a much more sophisticated rear suspension setup that really does translate to improved roadholding and ride quality. Inside, the Camry's dash features a striking zig-zag line from its instrument panel into its center console. There's a little more room for five, though we questioned the ease of access through a tight rear-door opening, and it's available in everything from sedate gray to a shockingly bright red with red-trimmed upholstery. With the Camry, Toyota also applies all its most advanced safety technology, including lane-departure warnings, blind-spot monitors, and forward-collision warnings with automatic emergency braking. The Toyota Camry was introduced to the U.S. market as a front-wheel-drive replacement for the rear-drive Corona. Quite boxy and basic, that first Camry won over masses of U.S. buyers who were reaching a critical point of frustration over the reliability and quality of domestic-brand cars. Subsequent Camry models became a little larger, more refined, and more comfortable and luxurious with each generation. When the second-generation Camry made its debut for 1987, the Camry's 115-hp, 2.0-liter inline-4 was quite technically advanced, as it was one of the first engines in an affordable four-door sedan with four valves per cylinder. Wagon variants of the Camry were reasonably popular through this period, and a five-door hatchback version of the model was sold through 1986. Toward the late ’80s, Toyota added a V-6 option for the first time, and it also began offering all-wheel drive on some versions, which signaled the automaker's intention to move the Camry upmarket. For 1991, Toyota broke the U.S. Camry line away from the version made for its home market, recognizing that American families wanted a larger product. The Camry was aimed solidly at the shoppers who were considering the Ford Taurus. Toyota had, in 1988, begun assembling Camrys for the U.S. in Georgetown, Kentucky, where the car is still produced today—and if there's any doubt about how American it is, don't forget that it races in NASCAR. Two different U.S. Camry generations spanned the 1990s. The first (distinguished by rounded sheet metal and soft features) offered a tremendous leap in luxury over the previous model. The latter, fourth-generation Camry was panned at launch for its especially bland styling, but it was an even stronger seller. The wagon was discontinued in that generation. Through these two generations the Camry didn't make any tremendous advances, but its 4-cylinder and V-6 engines grew in size and produced more power. Used Toyota Camry models are a staple of the used car market, though you'll likely find fewer from before 2000 these days. 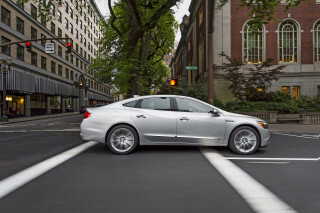 They continue to be comfortable and spacious sedans, though they're far from sporty. Toyota has continuously updated the safety equipment and added popular features to keep the Camry competitive, including navigation systems, smart-key entry, and heated leather seats—all items hard to find on mid-size volume sedans not so many years ago. Two generations of the Camry have emerged in the last decade. The previous generation, introduced for 2002, introduced a rounder look once again—this time making major advances inside with significantly upgraded materials—with a stronger 162-hp, 2.4-liter base inline-4. A 192-hp, 3.0-liter V-6 remained a popular option, and safety features were bolstered during this generation with the phasing-in of side airbags and stability control on some models. The Camry was redesigned again for 2007, bringing a smoother, less slab-sided look, much-improved safety, and a new powertrain at the top of the range—a 268-hp, 3.5-liter V-6 and 6-speed automatic transmission. In this latest generation, a tighter suspension and upgraded wheels in the SE V-6 model brings a more sophisticated VDIM stability control system and a surprising level of responsiveness and performance satisfaction, if you could get past the bland appearance. Along with the 2007 refresh, Toyota introduced its first first Camry Hybrid. 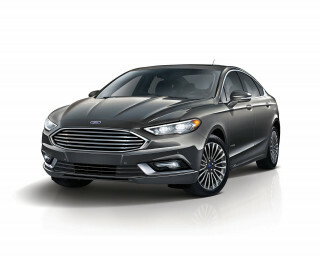 It used a version of the company's Hybrid Synergy Drive system, which was originally designed for use in the Prius, pairing an Atkinson-cycle version of the 2.4-liter 4-cylinder with electric motors. The total system output was 192 hp, matching the old 3.0-liter V-6, but beating it handily in EPA fuel-economy testing—the Camry Hybrid came out of the gate with ratings of 33 mpg in the city and 34 highway. For 2010, the base Toyota Camry received an even larger inline-4—a 2.5-liter, making 169 or 179 hp, while fuel economy was actually made better thanks to a new 6-speed automatic. A 6-speed manual remained available on a limited basis with the 4-cylinder engine. A 2012 redesign didn't recast the Camry, but instead brought substantial improvements to comfort, refinement, and handling. From the outside the changes were so evolutionary that some might only see it as a mild refresh. 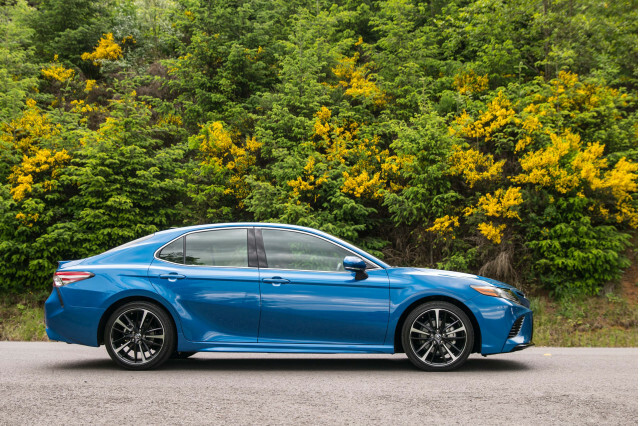 Gas mileage was also improved across the lineup (up to 25 mpg city, 35 highway for the 4-cylinder), and a completely reworked Camry Hybrid—with an EPA city rating of up to 43 mpg—was the star of the lineup. 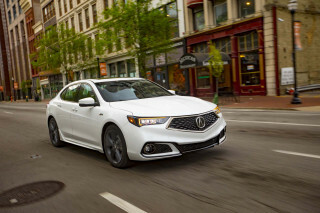 Safety features were also significantly upgraded, with 10 standard airbags, newly standard side rear thorax bags, and an improved structure, while Bluetooth hands-free connectivity was made standard on all models. The 2013 Toyota Camry earned a few more trim and feature changes—like expanded availability for blind-spot monitoring, which was packaged with rear cross-traffic alert. Even base Camry L models for 2013 received an updated infotainment system, as they tightened their game against the all-new 2013 Honda Accord. The only blemish to the Camry's longstanding rivalry versus the Honda Accord? In a round of crash-test results for the new IIHS small-overlap frontal test, Honda managed the top nod, while the Camry was rated "Poor." Those ratings inched up in subsequent updates. For 2015, Toyota gave the Camry a full makeover. All of the body panels were replaced with reshaped parts, and the interior was upgraded with new technology and nicer materials. Toyota also modified the chassis to make the Camry more involving to drive, while the powertrains have been left alone. The Camry offered a range of powertrain options, including the base model's 178-hp inline-4, the fuel-sipping Hybrid model, and the range-topping V-6 that made 268 hp. The Camry was offered only in a sedan body, as it has been for years, although past generations offered both coupe and convertible versions. Improvements made to the Camry's design for 2015 made it an IIHS's Top Safety Pick+, with top "Good" ratings in all categories, including the new small-overlap crash test. Toyota also added active-safety items to the standard and optional features list for 2015. A suite of advanced safety features including forward collision warning with automatic emergency braking, adaptive cruise control, automatic high beams, and active lane control were all standard for 2017 .